Students from Y10 and 11 visited the Cavendish Laboratory, University of Cambridge, for a morning of “Physics at work”. Students were accompanied by Mr Guerrin and the rest of the science team: Mrs Ainscough, Ms. Chaudhry, and Mrs. Angelillo. 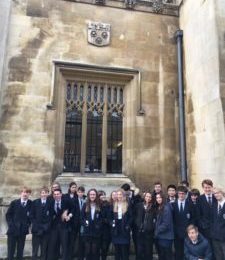 The trip was enjoyed by all and recognised the broad range of potential careers in Physics and how Physics careers overlap with other Science and Technology disciplines.